Lickety Split Press is an independent letterpress studio in Kentucky, run by designer Emily Zalla and her trusty four-pawed apprentice, Lincoln. Every piece we sell is fed by hand through our carefully restored 1913 Chandler & Price letterpress. Lickety Split is a beloved side HUSTLE. During the day, Emily works as a senior designer at Hyperquake in Cincinnati, designing brands, websites, prototypes, installations, and product concepts of all types. But she spends evenings and weekends with this 1600-pound cast-iron press creating tiny little works of art. Letterpress is an old-school printing method where you roll ink onto a raised plate (either type or image), then apply that plate to a sheet of paper to transfer the design. (Play the video below to check it out.) Letterpress has been coming back in style, as people start falling in love with products that have that “human” touch. It’s very popular now for everything from wedding suites to business collateral and retail materials. 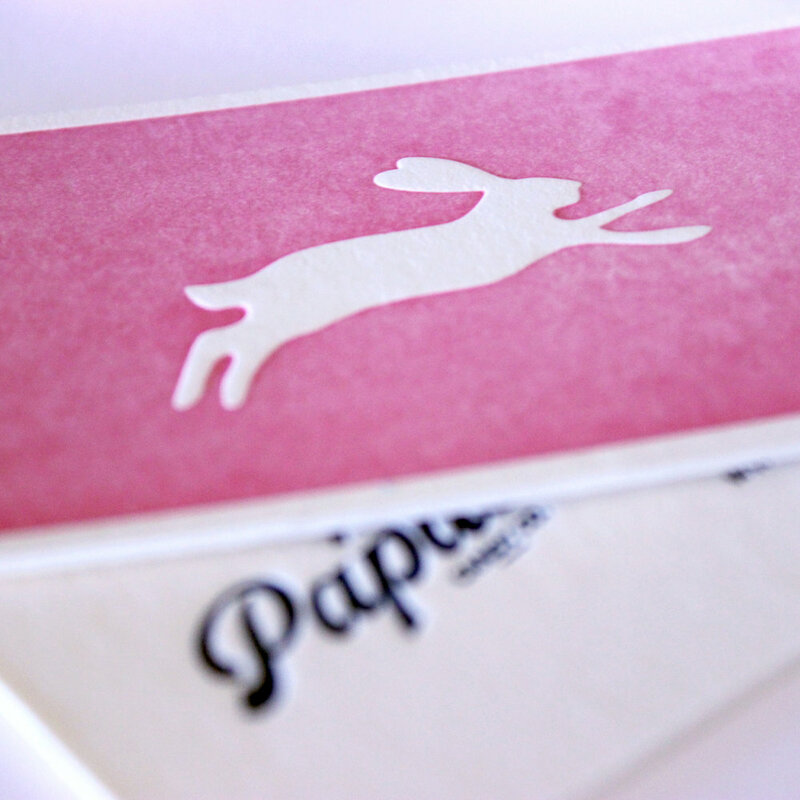 We typically use 100% cotton paper (which allows a beautiful, deep impression), with hand-mixed letterpress inks. Every sheet is fed by hand (carefully! ), and that process is repeated for every color in the design. It’s a painstaking process, but totally worth it — and it can be more affordable than you might think. We love a challenge, so if you want an unusual paper color, shape or size, just ask! We can also accommodate duplexing, foilstamping, or other print techniques you want to mix in. And hey, we know what a thrill it is to have your own artwork brought to life on press — so if you’re a designer or entrepreneur and want us to print from your files, we’d be happy to do it! Not sure whether letterpress is right for your project? Reach out. We’ll be happy to talk you through the process (and refer you to another resource, if some other print method is better for you! ).